In the closing days of World War II, the Soviet Union began systematically to ravage what Adolf Hitler had once called his Thousand Year Reich. Berlin was destroyed, and in the Soviet zone of occupation many thousands were murdered. Uncounted numbers of POWs simply disappeared into the gulags, never to be heard from again. Entire factories were dismantled and shipped East. The Western nations took a far different approach. Instead of repeating the harsh peace of Versailles, the United States, as the dominant allied partner, opted for an occupation that had as its eventual aim the restoration of Germany so as to prevent future militarism and install a democratic political system to replace the Nazi regime. How that came about is the subject of historian Michael Beschloss's The Conquerors, a fresh look at how Franklin Roosevelt proved instrumental in determining the shape of postwar Germany. Beschloss draws on exhaustive primary sources, including newly opened Russian archives and the private papers of the wartime secretary of the treasury, Henry Morgenthau, Jr., whose tempestuous relationship with Roosevelt supplies the book's major subplot. Although the U.S. government learned of the existence of Nazi death camps as early as 1942, Morgenthau became increasingly distraught over what an official report he commissioned called "the Acquiescence of This Government in the Murder of the Jews." Haunted by what he viewed as Roosevelt's indifference to the plight of Europe's Jews, but unable to sway the president, Morgenthau put forth his own plan in 1944 for an exceptionally harsh peace, which would turn Germany into a harmless agrarian state by completely dismembering its industrial base in the Ruhr. Although Roosevelt grudgingly accepted the Morgenthau plan and presented it to Churchill at Quebec in 1943 [sic. September 1944] as American policy, it was strongly opposed by Secretary of War Henry L. Stimson, who viewed Morgenthau as meddlesome and misguided, and thwarted him at every turn, as did Assistant Secretary of War John J. McCoy and Secretary of State Cordell Hull. The current political struggle within Washington over Iraq almost pales by comparison to the fierce infighting that took place within the Roosevelt administration during World War II. FDR played his advisers off each other. Sometimes he would make promises he had no intention of keeping; other times he would skilfully manipulate Morgenthau, who was hoping to gain more influence over Germany's future by becoming secretary of state, an ambition that FDR privately rejected. Ultimately, however, Roosevelt's reluctance to repeat the mistakes of history -- i.e., his refusal to pursue a Versailles-style harsh peace -- led to a more benign American course of action toward Germany. Despite all the Roosevelt administration's intrigues and power struggles, the U.S. government eventually adopted a more moderate strategy for dealing with postwar Germany. After FDR's death, Harry Truman followed the same set of policies. The Conquerors focuses mainly on the Allied demand for unconditional surrender from Germany, together with American occupation policy after the war ended. But the most explosive issue that Beschloss explores is why, in the face of mounting evidence of the terrible atrocities being committed in Hitler's death camps, the Allies failed to bomb Auschwitz, the infamous Polish concentration camp. As the senior partner in the Anglo-American alliance, the United States had the ultimate authority to make such a decision. Therein lies the most controversial aspect of Beschloss's book. Many critics laid the blame for the U.S. government's failure to act with McCoy, who later publicly denied that he ever discussed the matter with Roosevelt. But Morgenthau's son revealed to Beschloss that McCoy admitted to him in 1986 that he indeed had discussed it with the president -- who forcefully rejected bombing Auschwitz on the grounds that it "wouldn't do any good" to kill innocent people. "I won't have anything to do with it," FDR is alleged to have said. 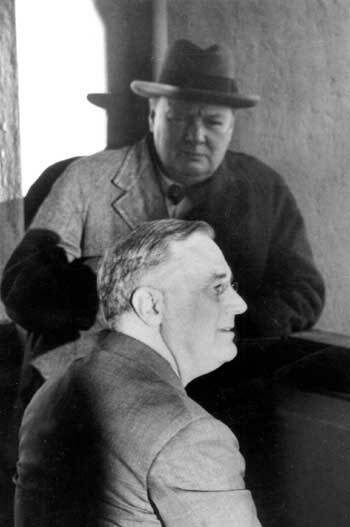 Although McCoy's private revelation after years of denying Roosevelt's involvement is unsubstantiated, it nevertheless suggests the first direct link to Roosevelt as the arbiter of one of the most important and controversial decisions of World War II. Beschloss fairly presents both sides of the debate, but also doesn't conceal his own belief that the Allies gravely failed to deliver "a moral statement for all time that the British and Americans understood the historical gravity of the Holoucast." FDR rejected repeated exhortations by Morgenthau to initiate the bombing of Auschwitz. Not only did FDR fail to address the Holocaust, Beschloss argues; he also remained "shockingly disengaged from the struggle to rescue Jewish refugees from Hitler." Nor did he attempt "to explore whether death camps bombings and transportation lines might have saved lives." Before relinquishing his post as U.S. occupation commander in October 1945, Dwight Eisenhower said, "The success of this occupation can only be judged fifty years from now. If the Germans at that time have a stable, prosperous democracy, then we shall have succeeded." More than 50 years later, we can see the Eisenhower's visionary aspiration is a reality. Modern-day Germany, writes Beschloss, "resembles the Germany that Franklin Roosevelt and Harry Truman once imagined far more than either man could probably have ever dreamt." Even as Beschloss wades fearlessly into the debates over U.S. culpability in prolonging the Holocaust, he shows here a keen understanding of a larger historical truth: While Roosevelt's legacy will remain controversial over the question of Auschwitz, his flaws, Beschloss concludes, "are overshadowed by the greatness in Roosevelt's leadership." This was especially so in the critical years of 1939 and 1940, when FDR dared to send aid to a beleaguered Britain. "Had Roosevelt been more meek or shortsighted," Beschloss writes, "Hitler might have won World War II." Carlo D'Este is the author of "Patton: A Genius for War" and "Eisenhower: A Soldier's Life." I HAVE always enjoyed the books by Michael Beschloss; his work on Kennedy and Roosevelt, which I looked at twenty years ago, was compulsive reading (Beschloss had benefited from rare access to the private diary of Joseph P Kennedy, who turns out to have had, ahem, unorthodox views about the Jews, which may be one reason why it is not generally available to researchers at the Kennedy Library). I do not know whether Beschloss is Jewish or not but, if he is, this may have clouded his perspective. What he overlooks is that what is now brand named as The Holocaust did not bulk large in any of the wartime leaders' sensibilities. There is no reference to it at all in the bulky memoirs of Dwight D Eisenhower, Winston S Churchill, Charles de Gaulle, Harry Truman, or any of the lesser fry. They would now be called Holocaust Deniers. It became a concept only with the emergence of what Norman Finkelstein so aptly named The Holocaust Industry in the early 1970s. I remember standing in the hallway of the Institut für Zeitgeschichte in Munich, and being asked by the late Professor Helmut Krausnick, eminent doyen of the German historians: "Herr Irving, you are English: Can you help us? What does this new word we are hearing -- Holocaust -- mean?" That was how things were in the early 1970s. Those who were trying to win the war against the Nazis on more general grounds -- i.e. the entire civilized world -- took offence at the manner in which the Jewish community were trying to skew its aims to their own ends. When Henry Morgenthau, the third member of the War Refugee Board next to Cordell Hull and Henry Stimson, issued the infamous Report in November 1944, based on the highly dubious testimony of such "eye witnesses" of Auschwitz as R Vrba (Rosenberg) and Wetzler, both of whom were exposed as frauds in later years, Stimson was furious that Morgenthau had rushed the document into public print without the permission of the WRB's other members. Even so, Beschloss is right on the general point that Roosevelt was hostile to the Jews with whom he found himself surrounded in the later years of office, and in private he made little secret of his views. He dictated to Morgenthau -- and this must seem ironic in view of the university's current situation -- that the Jewish intake at Harvard must be sharply reduced, to about five percent, if there were not to be serious difficulties; and on another occasion he remarked to Morgenthau that no American community -- be it town or village -- could reasonably be expected to put up with the arrival of more than one Jewish family. Morgenthau's diary records no objection to these remarks, which would today be regarded as less than politically correct.